CB Craft Brewers (originally named Custom BrewCrafters) started in 1997 brewing private label beer for area bars and restaurants. Now their tap room features 26 craft beers on tap featuring their CB brand beers as well as some of those private labels brewed for area watering holes. It’s always a good time at CB’s taproom and tavern – and National Beer Day is no exception! Stop in for holiday specials of $4 hoppy hour pints all day long and brunch and craft beer cocktails from 10 AM to 4 PM. Mortalis believes in the connection among us mortals in this universe – with stories to tell, dreams to live, and beers to share. Enter their galaxy with their space-themed mural and nods to mythology with beer names like Poseidon&apos;s Revenge and their Milk of the Gods series. 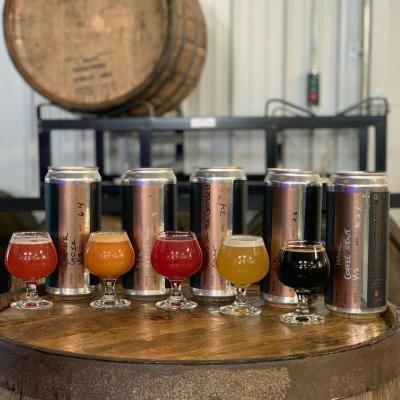 Be sure to follow them on social media to learn about their weekly crowler releases. Choose your own adventure at Ithaca Beer Co., located in the heart of Ithaca. From brewery tours (available on Saturdays and Sundays) to a rotating menu of tasty seasonal fare in their tap room. Their on-site farm provides their kitchen with produce, eggs, and chicken making their food as local as possible! Enjoy a pint out in their beer garden or purchase one of their new variety packs for spring – Box of Sours and Box of Hops. Whatever you decide, you will be sure to have a good time. 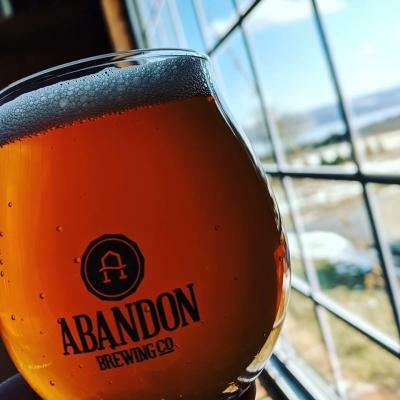 Abandon Brewing’s early 1880s reconditioned barn provides a beautiful view overlooking Keuka Lake and Keuka College. And their beers are just as memorable with two series. 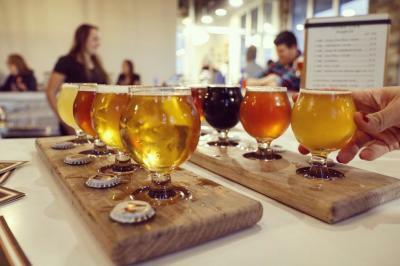 Their Flagship beers are traditional, go-to beers that are boast deliciousness and consistency. Meanwhile, their Woodshed series offers specialty-crafted beers across unique styles that showcase the creativity of their brewers. See which you prefer when you stop in for a pint, and be sure to grab a crowler to-go. Out of Weedsport (and soon to have a tap room in Sodus Bay), this dog-loving brewery aims to serve the finest “doggone” brews. They invite everyone to wet their whistle with an incredibly fresh pint brewed with passion and as many local ingredients from local farmers as possible. Lap up a beer – try their award-winning Toasted Coconut Porter – next to their four-legged mascot, Trooper, who is in charge of Grrrowler Sales and inspiration for their logo. The moment you step into Young Lion Brewing, located at the north edge of Canandaigua Lake, you will smell the specialty malt coming from the mill room. Then settle around their open tasting room with views of the glistening lake or a sports game on TV – your pick. Choose from their flagship brews - IPA, Double IPA, and Pilsner - or try something new on tap such as the Lucky Charm pilsner and Citrose gose. Can’t make a decision? Order a flight and sample multiple brews! Originally only serving beer to-go, Cortland Beer Company now welcomes you to enjoy fan-favorites by the pint or flight. (Okay, and if you still want it to-go, pick up a can, growler, or keg!) 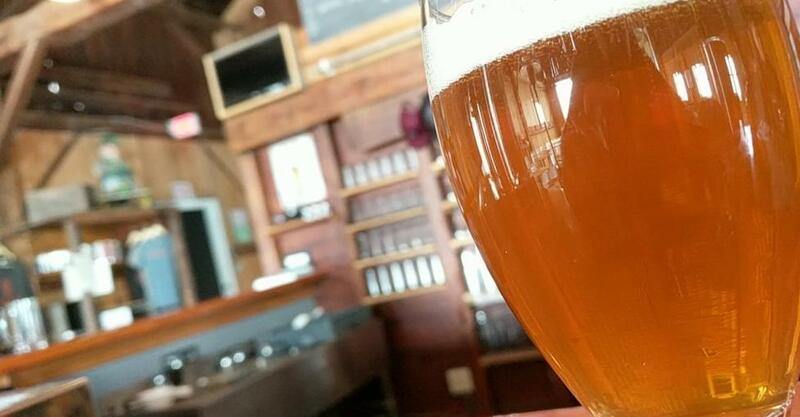 Located in Historic Downtown Cortland, this farm brewery makes a name for itself with eye-catching beers such as Heffer Weizen wheat beer (complete with cow on the label) and Naked Lap lager. Can’t make it for National Beer Day? Stop out on a Friday night for their weekly Cortland Beer Concert Series! 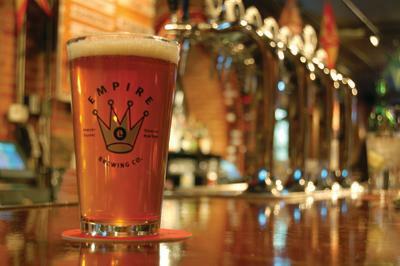 Empire Brewing has two locations to choose from – their farm brewery on 22 acres of virgin farmland in Cazenovia and contemporary brewpub in downtown Syracuse. The heavily award-winning Skinny Atlas Light is an American Ale named for Skaneateles Lake which Empire draws its brewing water from. Other tasty options include White Aphro, a Belgian-Style unfiltered Wit Ale and the recently released Liv n’ Let Rye IPA. These beers pair perfectly with any of the dishes on their menus – burgers, sandwiches, salads, and other shareable snacks. Having a hard time navigating through the sudsy options? 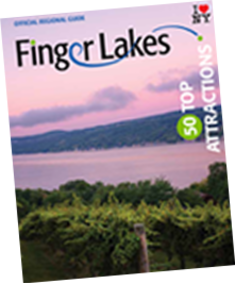 Check out the ROC/FLX Craft Beverage Trail or the Official New York Craft Beer App to find breweries near you.